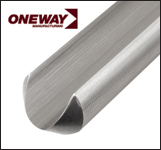 The Oneway Mastercut Gouges are unhandled and made of CPM M4 high speed steel to hold an edge up to 3 times longer than tools made of M2 high speed steel. These gouges are available in single flute and double flute versions. When used with a Oneway Shure Grip or similar handle, the turner can have a different grind on either end of the tool. Mastercut Gouges are sized by the diameter of the steel. They are Unhandled.